Lloyd of Gamebooks: Cymerian - Dice or no? series of mini gamebooks using the system. Dice or no dice? I have put the outlines of character creation and items for diceless and diced systems here. Tell me what you think. "Dice or No"... Sounds so Cornish me hansome. 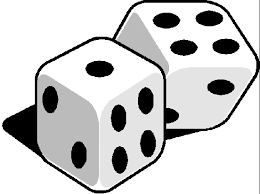 I would say Dice, or rather a modicum of uncontrolability(?) on the part of the player. Having all the power to choose how the story will play out is enjoyable to a degree but lacks the thrill and challenge and is as boring as purely random dice. Something is missing, it's like reading the Two Towers but choosing to skip the Ent bits. The trick is rewarding clever play to give some form of bonus (not necessarily numerical). Not letting the reader always have their own way forces them to make choices and surely that is the core element of a Gamebook? In "The Sinister Fairground", there is dice rolling (with booster items and change of weapons during the combat). Great to choose depending on the enemy and your inventory. In "Heavy Metal Thunder", we use an easier dice system with a weapon selection just before the fight. It's an agile system but you have to be careful with the ammo and the weapon proficiency you've chosen customizing your character. In "Necklace of Skulls", there is no dice. It's a new strategic combat based in rounds of 3 movements, that are solved simultaneously at the end of each round. It's challenging to anticipate enemy's strategy! So, every combat system has its own charm! Ask people, listen to testers, and... good luck!